Egypt, 1912. 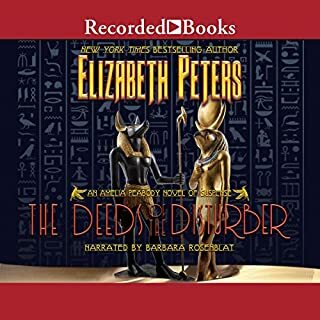 Amelia Peabody and her dashing archeologist husband, Radcliffe Emerson, are once again in danger as they search for a priceless stolen bust of legendary Queen Nefertiti and Amelia finds herself the target of assassins in this long-awaited, eagerly anticipated final installment of Elizabeth Peters' best-selling, beloved mystery series. 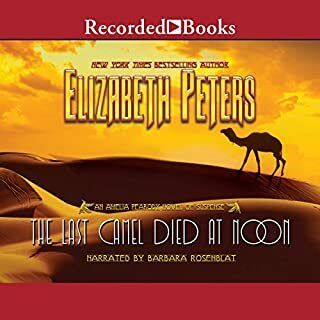 Arriving in Cairo for another thrilling excavation season, Amelia is relaxing in a well-earned bubble bath in her elegant hotel suite in Cairo when a man with a knife protruding from his back staggers into the bath chamber and utters a single word - "murder" - before collapsing on the tiled floor, dead. Among the few possessions he carried is a sheet of paper with Amelia's name and room number and a curious piece of pasteboard the size of a calling card bearing one word: "Judas". Most peculiarly, the stranger was wearing a gold-rimmed monocle in his left eye. 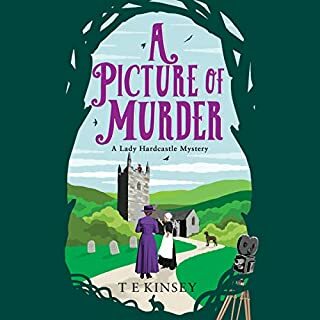 It quickly becomes apparent that someone saved Amelia from a would-be assassin - someone who is keeping a careful eye on the intrepid Englishwoman. Discovering a terse note clearly meant for Emerson - "where were you?" - pushed under their door, there can be only one answer: the brilliant master of disguise, Sethos. 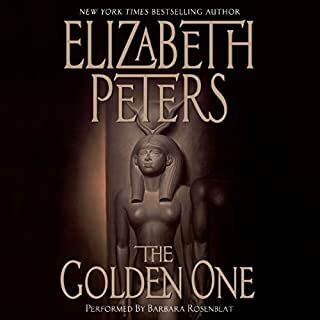 But neither assassins nor the Genius of Crime will deter Amelia as she and Emerson head to the excavation site at Amarna, where they will witness the discovery of one of the most precious Egyptian artifacts: the iconic Nefertiti bust. In 1345 BC the sculptor Thutmose crafted the piece in tribute to the great beauty of this queen, who was also the chief consort of Pharaoh Akhenaten and stepmother to King Tutankhamun. For Amelia, this excavation season will prove to be unforgettable. 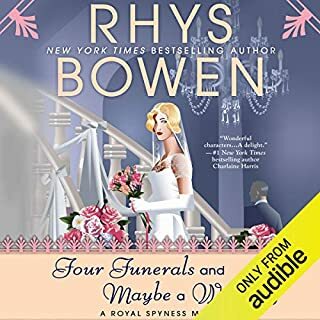 Throughout her journey, a parade of men in monocles will die under suspicious circumstances, fascinating new relics will be unearthed, a diabolical mystery will be solved, and a brilliant criminal will offer his final challenge...and perhaps be unmasked at last. It was an enjoyable performance as always. The story was not quite as nuanced as EP’s actual work, but was certainly similar and I felt the characters were pretty true. 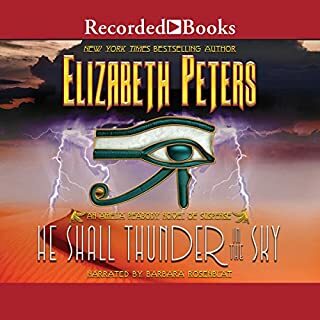 Would you be willing to try another book from Elizabeth Peters and Joan Hess ? Why or why not? Did The Painted Queen inspire you to do anything? Horrrendous, did they check the previous books! This was a major disappointment, I can't believe the errors and inconsistencies. Amelia doesn't faint or wait for Emerson to rescue her, she charges straight into the thick of things. Nephret doesn't whine, Ramsey doesn't have to threaten and David doesn' t disagree. What a waste of time and money. I think this is perhaps the best final salute to Amelia Peabody and her creator Elizabeth Peters that we fans of the series could expect. And I'm glad it was attempted. Reviewers have pointed out ways that these characters stray a bit from the height of Peters' style. I both agree and disagree. The later Peters books themselves were a bit of a disappointment - the ones where she was filling in spaces between the previous stories instead of moving the lives of the Emerson families forward. 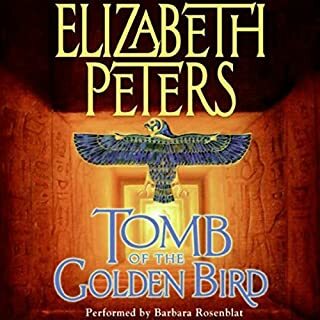 In my opinion, her last really wonderful book was &quot;The Tomb of the Golden Bird&quot;, but there she obviously found a natural ending to the saga of the family. The later &quot;hindsight&quot; tales must have been primarily at her fans' and publishers' urging. 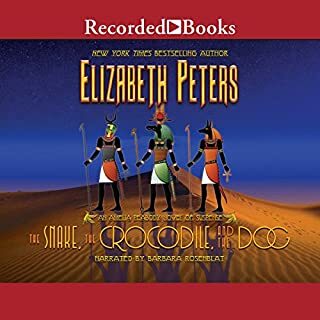 So it's not surprising that Peters herself sought to return once more to Egypt before her death, or that she chose to pair the incomparable Amelia with the incomparable Nefertiti. I believe that her friend and colleague Joan Hess did an excellent job of honoring the spirit, the vocabulary, and the humor of Peters' work and gives us a fine posthumous volume. 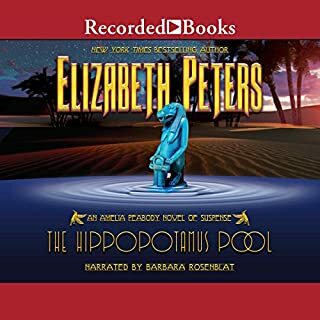 I have and will return again to Amelia's stories as narrated by the fabulous Barbara Rosenblat. There's a sadness in knowing there will be no more, but I'm grateful for this last tribute. It would have been a shame to leave some of Peters' writing unfinished. 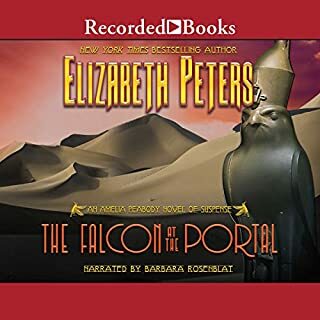 Barbara Rosenblat's narration made this book worthwhile. There were several errors and inconsistencies, and at times I felt I was listening to an abridged version. As others have said, it is surely difficult to finish someone else's work. But, perhaps, this one should have been left where it was. Same names, not the same characters. 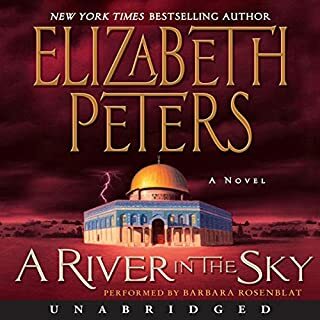 Would you try another book from Elizabeth Peters and Joan Hess and/or Barbara Rosenblat? 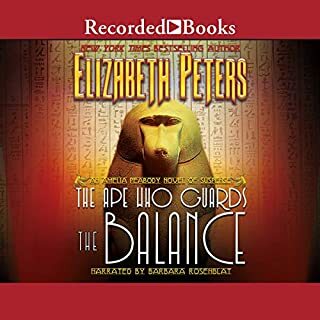 If you’ve listened to books by Elizabeth Peters and Joan Hess before, how does this one compare? I really wanted to like this book. 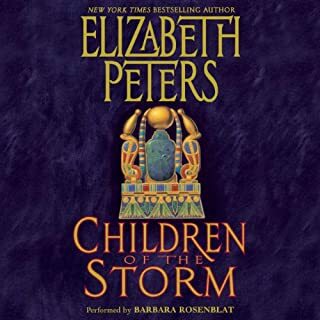 I know it wasn't fully written by Elizabeth Peters and unfortunately it was very obvious. I'm sure she had some large shoes to fill as an author especially for a series of so many books written already, but I feel like the characters were all so UNLIKE themselves! I found myself rolling my eyes and saying she/he would have never done/said that, and that is not right, that's not how that went etc. It lacked so much. I think if you had never heard of the Emersons it would be a good book. I normally check the run time periodically because I don't want the book to end and this time it was so I could see how much longer I had to endure it. I kept thinking I should just stop listening but I did have to find out how the story ended. Not like herself. I feel like she was directed to perform differently and even though it was close... she missed the mark on many of my favorite characters this time. Overall, it could be an enjoyable book if you don't mind the differences in the characters. Four star rating. Emerson's favourite color is crimson, not scarlet. The explanation of why Amelia needed an interpreter is weak. By now she should be fluent in Arabic. Fatima was the housekeeper, not the cook. I believe he was Mamoot. Some of the voices were off, Amelia, Nefret, David and Fatima. Definitely not an Elizabeth Peters story. What did you like best about The Painted Queen? What did you like least? 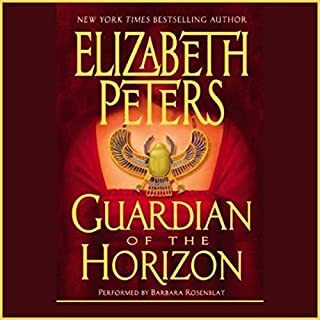 Would you recommend The Painted Queen to your friends? Why or why not? No. 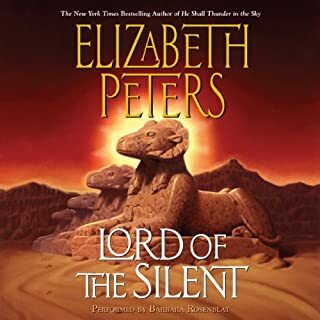 I have loved Elizabeth Peters in all her works over many years. I was wary upon hearing of a new Amelia Peabody book posthumously written by Joan Hess. While I am sure she (Joan Hess) has done her best she is no Elizabeth Peters. 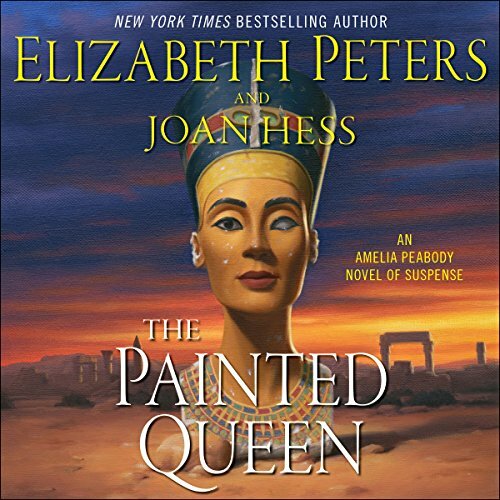 Amelia and Emerson are only pale echos of their real selves in the Painted Queen. I have listened to all the Amelias' on audible so many times I know the text nearly by heart. Joan Hess should have done the same. The flow and syntax is all off in her (Joans) rendition in this book. Always enjoy Barbara Rosenblat, but even she couldn't save this book. Was The Painted Queen worth the listening time? No I will be returning it. Leave great masters alone after they die and let their works live on without embellishment..
Like most readers I was looking forward to spending time with Amelia, Emerson and their family and friends. 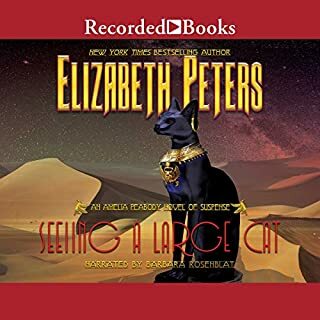 I realized that it would be a daunting task for Ms Hess to capture the style and wit of Elizabeth Peters writing, but I wasn't expecting a story full of so many errors - errors that are just careless. Things like: Nefret did not have a clinic in Luxor at this time, she had a hospital in Cairo; she didn't go to Paris to recover from the trauma in The Falcon at the Portal, she went to Switzerland; Daod did not have multiple wives and a large family; Amelia carried brandy in her belt of tools not whiskey; she wore trousers as her working costume not a divided skirt; Catherine was not Amelia's oldest friend and did not know Ramses as a baby - he was 16 when they met. These are just a few of the mistakes, there are many more. There are plot points that don't make sense and people acting out of character. So instead of enjoying this book, I find myself noticing only the errors and saying things like "Emerson wouldn't act like that". I'm only a third through this book and I can't believe I'm trying to decide if it's worth it to finish the story. However, I agree with the majority of reviews here. Too many violations of canon. In my yearly &quot;reading&quot; of this series, I will probably never listen to this again. 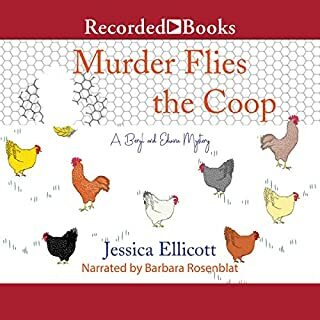 Ms. Rosenblatt's narration is off, too, here. She is the reason I fell in love with Amelia. Her characterizations have rarely faltered, but the first part of this book sounded like she was recovering from the flu. It got better as it went on, but... Ah, well. Thanks for the effort, Ms. Hess. I think I will look for some fanfics online, see if anyone else has tried to fill in some of the holes left by Ms Peter's sad demise. No...because Elizabeth Peters passed away and Joan Hess is not up to the task of Amelia Peabody Emerson. What three words best describe Barbara Rosenblat’s performance? Barbara is my favorite. Always a good job, but was a little lacking in this installment. It just struck me as her being "not that into it" for some reason. Yes, it inspired me to return this book, as I can not finish it, and to be satisfied with the first 19 books and let the series rest in peace from that point on. I love Elizabeth Peters. But this book was so obviously NOT written by her. She was supposed to have started the book, but in the first chapter alone I have found 3 things that could not have been written by her, so that begs the question was ANY of it written by her. No.1 - Emerson's favorite color on Amelia is not scarlet...it is crimson. Through 19 books it has always been crimson. Although the two colors may be &amp;quot;red&amp;quot;, it should have been written as crimson. No.2 - Nefret did not go for treatment in Paris. She went to Switzerland. If miss Hess had known enough about miss Peters books and story line to write the last installment available, then she could not have missed these 2 basic points. No.3- how many things do devoted fans of the Peabody series have to be reminded of anyway? 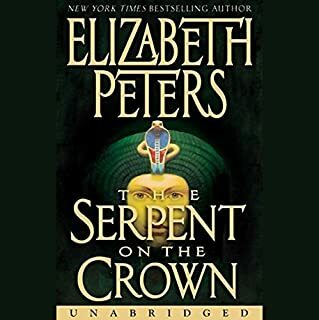 So far 95% of the first of this book is nothing but retelling of things devotees already know.I am sorry, but this is so obviously not Elizabeth Peters... Miss Peters may have had an outline and some sort of plot started, but when it comes to writing it all down, I don't think she penned a word of it.